Testicular torsion is an acute vascular event in which the spermatic cord becomes twisted on its axis, such that the blood flowings to and/or from the testicle becomes impeded. This results in ischemic injury and infarction. Testicular torsion in adulthood is relatively unusual and has a higher morbidity rate. Any delay in the diagnosis can lead to the loss of the spermatogenic function of the testis and an increased risk of orchidectomy. Closed reduction is the initial treatment of choice. Open surgical reduction is recommended for possible testicular torsion or rupture. Testicular torsion presents as an acute onset of severe scrotal pain, commonly associated with scrotal swelling and erythema. Nausea and vomiting are common, as are local scrotal redness and pain. The condition may result in loss of the testis. A 37-year adult male patient presented with gradual enlargement of the left scrotum associated with minimal local and abdominal discomfort for last two months. He reported 3-4 similar episodes in the past 1 month and was prescribed analgesics and antibiotics. His general and systemic examination was unremarkable. On local examination, there was palpable, 6 × 8 cm hard testicular swelling with preserved testicular sensations. Overlying scrotal skin was free and there was no local rise of temperature. There was slightly thickened and tender left spermatic cord. Hematological investigations were normal except for mild leukocytosis. Urine examination was normal. A colored Doppler ultrasound of the scrotum was suggestive of torsion of left testes and there were no signs of viability. The opposite testis and intra-abdominal examination were normal. An informed consent was taken for exploration with possible removal of involved testis and fixation (orchidopexy) of the other testis. On exploration, there was an intra-vaginal left testicular torsion with double knotting and nonviable testes. The epididymis was attached to the testes at the head and tail only [Figure 1]. A high left orchidectomy and right orchidopexy was performed. Histopathological examination revealed a massively necrotic testicular structure. The patient did well postoperatively. Acute scrotal pain is most commonly caused by testicular torsion, torsion of the appendix testis, epididymitis and orchitis. Of these, only testicular torsion is an absolute surgical emergency as testicular salvage is inversely related to the duration of ischemia. Physical examination techniques such as Prehn's sign (pain relieved when the testicle is elevated that occurs in orchitis) can be helpful in differentiating between epididymitis and testicular torsion. If the diagnosis is equivocal, radionuclide scan of the testicles (if possible) can be helpful to assess blood flow and to differentiate torsion from other conditions. Common complications are testicular atrophy, torsion recurrence, wound infection and subfertility, , possibly related to ischemia - reperfusion injury that damages the blood - testis barrier, with resulting antisperm antibody production. Recurrent torsion following an orchidopexy is possible (although rare) and may occur several years after the initial fixation of the testis. Thus, patients and parents should be forewarned about this risk and should promptly seek medical care if testicular pain occurs, even after an orchidopexy has been performed. Unfortunately, none of these models has yet generated adequate evidence to justify trials in human. 1. Cummings JM, Boullier JA, Sekhon D, Bose K. Adult testicular torsion. J Urol 2002;167:2109-10. 2. Macnicol MF. Torsion of testis in childhood. Br J Surg 1974;61:905-8. 3. Chapman RH, Walton AJ. Torsion of the testis and its appendages. Br Med J 1972;1:164-6. 4. Muguti GI, Kalgudi R. Torsion of the testis: Review of clinical experience in Zimbabwe. Cent Afr J Med 1994;40:119-22. 5. Ben-Chaim J, Leibovitch I, Ramon J, Winberg D, Goldwasser B. Etiology of acute scrotum at surgical exploration in children, adolescents and adults. Eur Urol 1992;21:45-7. 6. Liu CC, Huang SP, Chou YH, Li CC, Wu MT, Huang CH, et al. 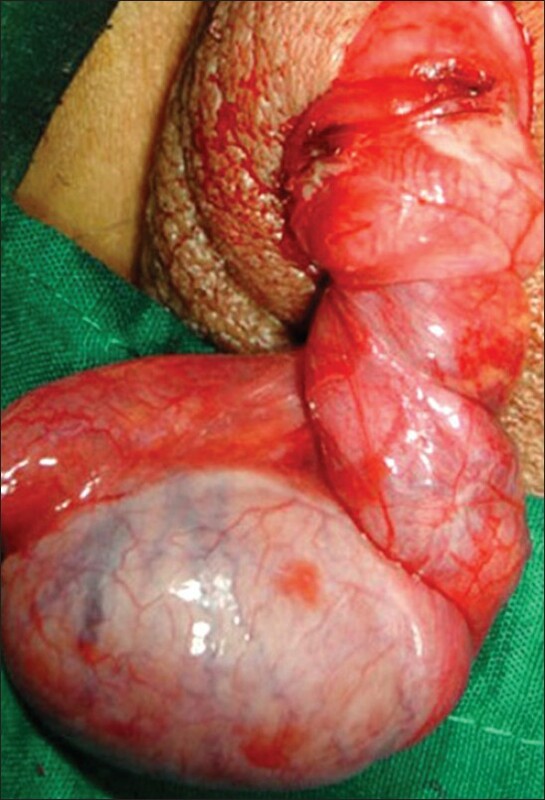 Clinical presentation of acute scrotum in young males. Kaohsiung J Med Sci 2007;23:281-6. 7. Favorito LA, Cavalcante AG, Costa WS. Anatomic aspects of epididymis and tunica vaginalis in patients with testicular torsion. Int Braz J Urol 2004;30:420-4. 8. Kass EJ, Stone KT, Cacciarelli AA, Mitchell B. Do all children with an acute scrotum require exploration? J Urol 1993;150:667-9. 9. Middleton WD, Siegel BA, Melson GL, Yates CK, Andriole GL. Acute scrotal disorders: Prospective comparison of color Doppler US and testicular scintigraphy. Radiology 1990;177:177-81. 10. Dunne PJ, O'Loughlin BS. Testicular torsion: Time is the enemy. Aust N Z J Surg 2000;70:441-2. 11. Ndaguatha PL, Misdiagnosed adult testicular torsion: Case report. East Afr Med J 2009;86:41-4. 12. Coley BD, Frush DP, Babcock DS, O'Klara SM, Lewis AG, Gelfand MJ, et al. Acute testicular torsion: Comparison of unenhanced and contrast enhanced power doppler US, color doppler US, and radionuclide imaging. Radiology 1996;100:441-6. 13. Williamson RC. Torsion of the testis and allied conditions. Br J Surg 1976;63:465-76. 14. Ringdahl E, Teague L. Testicular torsion. Am Fam Physician 2006;74:1739-43. 15. Davenport M. ABC of general surgery in children. Acute problems of the scrotum. BMJ 1996;312:435-7. 16. Abasiyanik A, Dagdonderen L. Beneficial effects of melatonin compared with allopurinol in experimental testicular torsion. J Pediatr Surg 2004;39:1238-41. 17. Ozkan KU, Boran C, Kilinc M, Garipardic M, Kurutas EB. The effect of zinc aspartate pretreatment on ischemia-reperfusion injury and early changes of blood and tissue antioxidant enzyme activities after unilateral testicular torsion-detorsion. J Pediatr Surg 2004;39:91-5. 18. Cuervo JL, Grillo A, Vecchiarelli C, Osio C, Prudent L. Perinatal testicular torsion: A unique strategy. J Pediatr Surg 2007;42:699-703. 19. Lee SD, Cha CS. Asynchronous bilateral torsion of the spermatic cord in the newborn: A case report. J Korean Med Sci 2002;17:712-4. 20. Aksoy H, Yapanoglu T, Aksoy Y, Ozbey I, Turhan H, Gursan N. Dehydroepiandrosterone treatment attenuates reperfusion injury after testicular torsion and detorsion in rats. J Pediatr Surg 2007;42:1740-4.